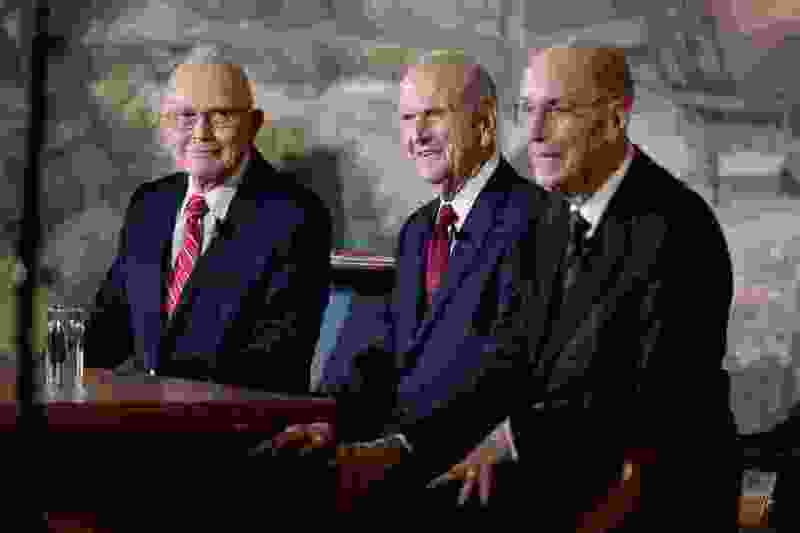 (Trent Nelson | The Salt Lake Tribune) Dallin H. Oaks, Russell M. Nelson and Henry B. Eyring at a news conference in the lobby of the Church Office Building in Salt Lake City on Tuesday, Jan. 16, 2018. Nelson was named the 17th president of the nearly 16 million-member Church of Jesus Christ of Latter-day Saints. Oaks was named first counselor in the First Presidency and Eyring second counselor. In a document titled “Preventing and Responding to Abuse,” congregational leaders in The Church of Jesus Christ of Latter-day Saints are encouraged to invite a parent or other adult to sit in an adjoining room when meeting with women and children. A change to those instructions includes the option for the interviewee to ask a witness to sit in on the interview itself. Houston businessman Sam Young, a former LDS bishop who launched a petition drive calling for an end to sexually graphic questioning and one-on-one interviews of young Mormons by church leaders, welcomed Monday’s announcement — as far as it went. Young plans a downtown Salt Lake City march Friday — the eve of LDS General Conference — to present church officials with more than 50,000 signatures supporting his position. More than 1,000 people have signed up for the rally. Their letter and the updated guidelines were sent to church general authorities, stake presidents, mission presidents, district presidents, ward bishops and branch presidents. That list of recipients is precisely the problem, said Tresa Brown Edmunds, a Mormon writer and activist in Sacramento, Calif. There are no women on it. Monday’s announcement comes after the leak of an audio recording and transcript of Joseph L. Bishop, president of the LDS Missionary Training Center in Provo in the 1980s, in which the now-85-year-old admitted to molesting a young female missionary, asking another missionary to bare her breasts and describing himself as a predator. The taped confession has caused outrage on the internet and propelled online commenters to ask Mormon officials to do more to curb abuse, protect the abused and punish the abusers. David Cook, an attorney in upstate New York who was a Mormon bishop in his 30s before rising to stake president, mission president and area Seventy, echoed that mandate in a recent Tribune “Mormon Land” podcast, urging LDS leaders to believe women when they divulge stories of abuse.